Thank you for your patience, last week, while I worked on the cookbook. You’ll be happy to know (I hope!) that the week off from blogging helped me accomplish the lion’s share of the editing I was faced with. If you want to secure your own copy of What to Feed Your Raiding Party at a discount, I’ve opened pre-orders here. Now, as promised, back to our regularly-scheduled creativity! Since before Todd and I got engaged, I’ve been a constant reader of Weddingbee.com. Even though it’s wedding-centric, many of the DIY projects the blogger-bees present have applications far-exceeding the wedding world. Last week,Â Miss Coyote (each bride-to-bee has their own moniker) posted about making a simply-bound book from all the cards she received at her bridal shower. And I thought to myself, Self, you could do that! 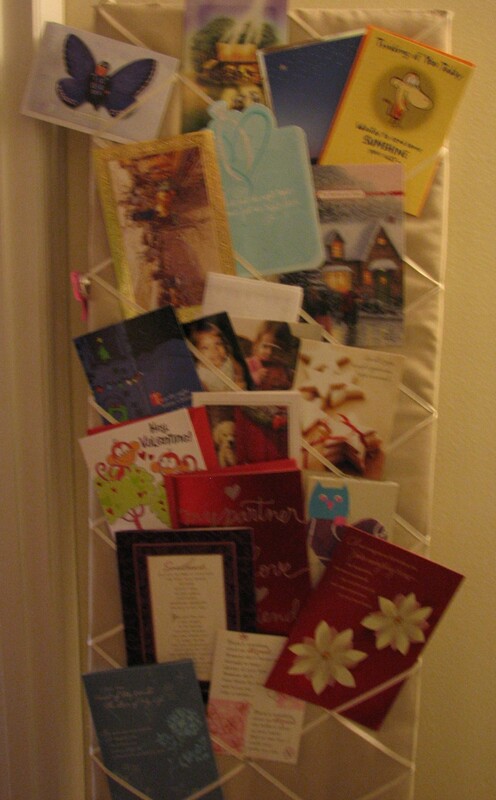 Here’s how the cards I’ve received over the past year and bit are usually displayed at home, in the folded French memo screen outside my door (folded because I have no place, currently, to display it fully extended). This is all well and good (and what I designed the screen for), but after a while it starts to get full and I keep knocking into some of the larger cards at swinging-hand height as I exit my office. Many people would just toss them but Todd is especially good at picking out awesome cards for holidays and birthdays. In case you didn’t click over to weddingbee, Miss Coyote tried rings, first, but settled on ribbon to bind her cards together through punched holes. I’ve shown both with the image below, using some spare cards I had lying around. I wanted something a little less intrusive to the cards’ fronts and, since the current art is bookbinding, this seemed the optimal time to dust off my rusty stitched binding skills. I knew of Coptic or Chain Stitch book binding, but all my sources used it with a cover–another thing I didn’t want to fool with. By the power of Google I finally found this awesome tutorial of how to do cover-less coptic stitch binding and it got me where I needed to go. I’ll leave the curious to check out that link for themselves, and show you the early steps you’ll need before the stitching takes place. First put your cards in the order you want them (I opted for more-or-less chronological) and, if all different sizes, get the bottom corners to all match up. Clamp them together so you’ve got your hands free for the next steps. Figure out your shortest card and measure the length of it. Mine was just a smidgen under 6 inches. Make a mark 5/8 inch or 1.5 cm or so from the top and bottom of this shortest card. You want an even number of holes, so divide the space between those first two marks evenly. I didn’t bother with exact math, just eyeballed it. It’s okay. Now you have to make the holes. You can punch each spine individually, but that’s time consuming. Instead, I suggest a small saw across the width of the spine. I couldn’t find my hacksaw (it might have gotten tossed in the last move) and Todd didn’t have one, but he DID have an amazing idea: a pumpkin carving saw! It worked perfectly. Just make sure you make enough passes that you make it through all the card spines. Once that’s done, unclamp the cards and check each spine to make sure it’s got all 4 (or however many) holes. If not, use the mini-saw or a needle to punch through in the right spots. After that, start your stitching. My card book has 19 signatures (cards, in this case, in a book it would be folded sections of pages) and it took a single episode of Star Trek: The Next Generation on Netflix to sew them. If I’d owned a curved needle (it helps get around the stitches as you work) it would have gone even faster! Now that was a fun, quick project if ever there was one! Oh, and I’ve got a giveaway going-on over at Nibbles ‘n Bites; all it takes is a comment to enter! Everyone has their own talents–if we were all makers, there’d be no one to appreciate the stuff we make! That’s such a cute idea! Congrats on your book! Thanks, Duckie! It’s really exciting–but then you know all about that! But that’s just it: it IS as easy as it sounds. And after the first couple of cards/signatures you get into a rhythm and it just flies by. Promise! Summer-Ready Redskin Potato Salad & Giveaway!